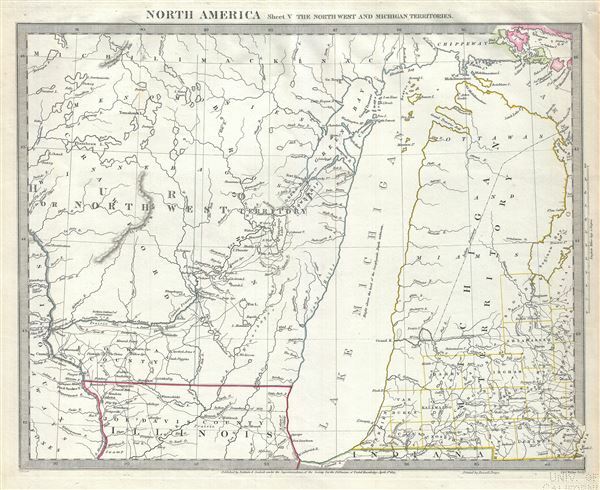 North America Sheet V The North West and Michigan Territories. This is a scarce and important map issued by the Society for the Diffusion of Useful Knowledge, or S.D.U.K. in 1833, depicting Lake Michigan, the second largest of the five Great Lakes, and the only one that lies entirely within the United States. Centered on Lake Michigan, it covers the surrounding region including the states of Michigan and Wisconsin. The map covers the Huron or Northwest Territory (modern day Wisconsin) and the Michigan Territory (modern day Michigan) along with parts of northern Illinois. It depicts territories and counties in outline color. Lake Michigan is slightly malformed and distended on the vertical axis. The map names several Indian tribes, including the Ottawa and the Chippeway. The Bad Axe River is also identified. It was near the mouth of the Bad Axe River that the Bad Axe Massacre or the Battle of Bad Axe was fought at the end of the Black Hawk War in 1832, a year before this map was issued. The Black Hawk War was a battle fought between the United States state militia and the Native American tribes Sauk and Fox. The leader of the Native American tribes was a Sauk warrior Black Hawk, who hoped to resettle on the land that was ceded to the United States in a disputed 1804 treaty. The Bad Axe Massacre took place as an aftermath to the Battle of Wisconsin. In this historic last stand, a mere 60 Sauk warriors held off over 700 U.S. regulars and militia under the command of Henry Dodge while the Indian women and children crossed the river to safety. At dawn the Sauk chief Neapope, concealed in a tree, verbally offered to negotiate surrender. The U.S. soldiers, lacking an interpreter, ignored his plea. Fleeing the aftermath of the Battle of Wisconsin Heights the remaining Sauk, mostly women and children, were cornered near the mouth of Bad Axe River and slaughtered. The war is most remembered for giving young Abraham Lincoln his brief military service. Rumsey 0890.132. Phillips (Atlases) 794.